Went down to the pond for a late evening visit tonight, to see what was coming in to roost. 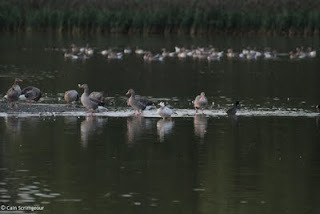 The Geese numbers have recently grew with 106 birds present this evening, 41 Canada, and 64 Greylag and a single Bar-Headed Goose which has been around since yesterday. It won't be long until the Pink-Footed Geese are back on patch. A single shoddy image for you. Also present were 14 Curlew and 13 Lapwing, both flocks left before us, with the Curlew heading East and Lapwing South. You should never use the word shoddy when refering to your own images. Record shot covers all bases ! !